How appropriations of strong female characters from "The Simpsons" and "Parks and Recreation" backfired on the right. 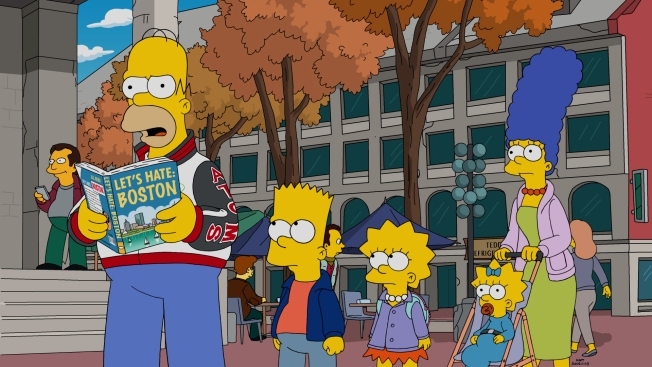 THE SIMPSONS: After Homer catches Bart rooting for Springfield’s football rival, the Boston Americans, he plans a family “hate-cation” trip to Boston in an attempt to show Bart that Boston is a terrible city on the all-new “The Town” episode airing Sunday, Oct 9, (8:00-8:30 PM ET/PT). THE SIMPSONS ™ and © 2016 TCFFC ALL RIGHTS RESERVED. CR:FOX. In an at least partially prescient 2000 episode of FOX's "The Simpsons," 38-year-old Lisa becomes president – and inherits a huge deficit run up by her predecessor, Donald Trump. The similarly future-set 2015 finale of NBC's "Parks and Recreation" ends with the suggestion that either Leslie Knope or her husband, Ben, is the nation's leader (fans are certain Leslie notched the top job). Lisa and Leslie are linked in the pop cultural consciousness as smart, strong characters brimming with idealism amid a morass of pessimism around them. Both got cynically used by the right this week – earning quick clap-backs from the "The Simpsons" and "Parks and Recreation" creative teams that underscored the tone-deafness of the political ploys. The lesson: Don't mess with people whose job is to make folks laugh (and occasionally think). Not that anyone necessarily learned anything. Sen. Ted Cruz (R-Texas), who once earned groans for making a video showing off his imitations of "Simpsons" characters, invoked the first family of Springfield Thursday at the Conservative Political Action Conference. "I think the Democrats are the party of Lisa Simpson and Republicans are happily the party of Homer and Bart and Maggie and Marge," he reportedly said. "Simpsons" showrunner Al Jean tweeted a pointed rejoinder: "Ted Cruz says Maggie Simpson would vote for him. I think Ted's the one who could use a pacifier in his mouth." "Parks and Recreation" co-creator Michael Schur offered a blunter reply after the NRA used a Leslie Knope GIF to thank Dana Loesch for representing the gun group at an emotionally charged CNN town-hall session on school shootings. "Hi, please take this down," Schur tweeted. "I would prefer you not use a GIF from a show I worked on to promote your pro-slaughter agenda." He also relayed a message from show star Amy Poehler: "Can you tweet the NRA for me and tell them I said f--- off?" That political discourse has come to speculating on the leanings of cartoon characters perhaps shouldn't be surprising in the era of a president who rose to power by playing a version of himself on a TV show. Neither should be an ill-chosen meme during an era when Internet-driven ideological battles are waged with everything from visual shorthand to outright falsehoods designed to sway the populace. There's a danger, though, in dismissing Cruz’s and the NRA's pop culture appropriations as mere silliness and ineptitude. Essentially mocking female characters who speak to the power of intelligence and hope is serious business. As Marge Simpson, likely a fan of government regulation might put it, the political monorail has run off the tracks.